A small hill noted for its cliffs, rolling and grassy top and permanently inclined trees. Finally, I’ve set foot in one of the country’s hidden gems. I was on assignment in Calayan Island in the Babuyanes and in between, I got to enjoy this piece of paradise in this part of the Philippines. Though it was just a few days, it was very memorable. I’m planning a longer trip later this year. 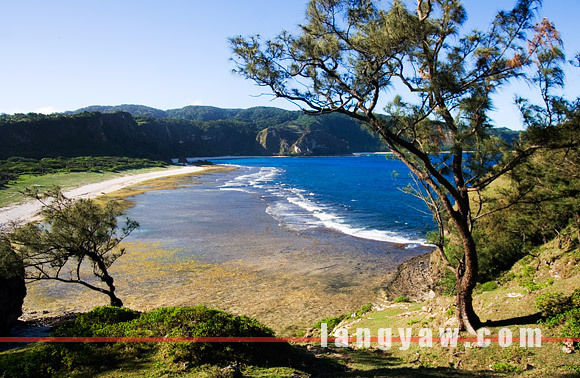 At the edge of Caniwara Cove is another spectacular place, Nagudungan Hill with its rolling terrain and gnarled pine trees with some, especially located near the edge to the sea are permanently inclined due to the strong winds. Its really a very small place at the top with access through a steep incline just where the trail opens up at Caniwara Cove and climbing up is sometimes shared with goats who graze the grass up hill. And when one is atop, and wow, the three coves: Caniwara, Cibang and Cababaan is spread right before one’s eyes. Its a scene from out of nowhere: the white sandy shores of the two coves, the slowly creeping wave of Caniwara and the cliffs and mountains that ring these three is just so awesome! Indeed, there is a god! Pine trees atop the hill. It’s a surreal landscape atop. Grassland, rolling terrain, heartbeat skipping cliffs that plunge down to a rocky base where the waves crash and break into foam. The sea side part of the hill is ringed with cavities and caves and one of our guides from Isla Biodiversity Conservation, an NGO based in Calayan Island said is a haven for sea snakes, those banded white and black serpents that are quite deadly. The hill used to have a lighthouse but due to a storm, it was destroyed, having been blown off with only its pedestal still in place, like a small landing pad ringed with bolts. Its hollow body now tumbled and resting a few meters below the base. Think of a toilet paper roll holder having been detached from its position but only in gigantic proportion amidst trees and grass. The hill is also known as Bangaan since there were jars used for burial were found in one section. I’m not sure if it is prehistoric or not but the people says they date to the Japanese occupation but I doubt it. In one area near the pit, was a hollowed ground with broken off parts of a clay jar. This might have been one of those artifacts. 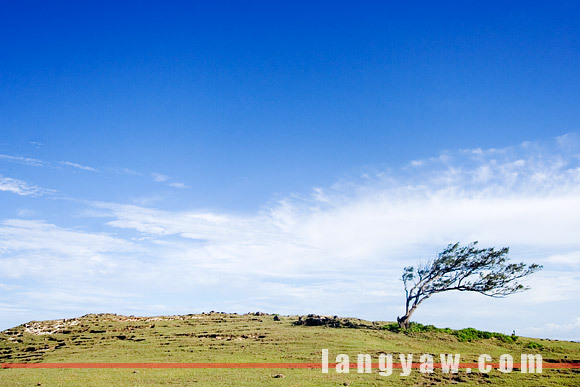 But one of the spectacular feature of Nagundungan Hill is the area that I will call The Pit. Its a massive but shallow hole near the sea and really, the rock surface is otherwordly with its striations emanating from the ground to the mouth of the pit. There’s a few cavities and caves below. Another surreal formation that can only be found here. Getting to Nagudungan Hill is just the same as going to Cibang Cove. Check the details in the Cibang Cove post. surprising nga kasi puro batanes lang napapansin sa islands in the north..
Sana mapuntahan ko din ito. beautiful, estan! i just wished it were more accessible. the pit is lovely! wow! i wonder if calayan has an airstrip ba? 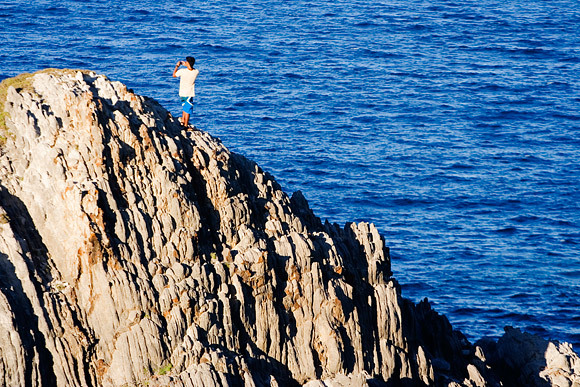 can i borrow some of your calayan photos….I’am a calayano….